Our windows have been naked since we moved. I am ultra-picky when it comes to curtains, and I don't sew. Cheap vinyl blinds won't cut it for resale here, but I hated to pay $28 a window for faux wood. Slowly--oh, so slowly--I've been gathering wood blinds as I see them. We have 20 windows. This pair cost $3.59 at a thrift store; Lowes sells extra mounting brackets for 60 cents. You can trim your own wood blinds within reason. My husband found it easiest to duct tape the slats together before trimming. We didn't have a table saw, but a jig saw cut both the metal header and the slats successfully. I have enough blinds to do all the bedrooms just as soon as Lowes orders more mounting brackets for me! I posted to you before about how I made curtain 'rods' from metal condut pipe. If your curtain has a 'rod pocket' the rod does not matter. I have used real copper fittings as finials on the end of some of my rods. Others I used as inside mounts where the ends don't matter. My husband copied some curtain holders from Country Curtain magazine and I have some nice curtains hanging for very little cost. Thanks for the wonderful blog. Where do you find all these blinds? Are they all white when you find them, or do you do any painting on them? Are they clean, and if not, how do you wash them? I've never even considered something like this, but it's a really good idea. What's the average price that you pay? I saw a large set of new blinds, meant to cover a large window, at a brand new Goodwill in our area, ....and Goodwill wanted $300.00 for them! I know that sounds like I am making it up, but it's the truth!! The Goodwill stores in our area are just ridiculous on a lot of items, so I am sure they'd charge a lot of money for even junky blinds. Roxie, thanks! I checked out the aluminum conduit to paint as I need two 9 foot rods for the living room. I thought I would spray them antique bronze. However, my husband only liked the $3 hooks to hold them, and I wasn't willing to pay $24 for hooks! So I am still on the lookout for cheap hooks to hold the conduit far enough away from the wall. More on that later! Susan, I have picked wood blinds (already white) up here and there. ONe pair from the thrift store, five alike from the Habitat for Humanity Homestore, three from a yard sale. Most have been pretty clean, but I am wiping them down with Fantastic and a damp sponge. 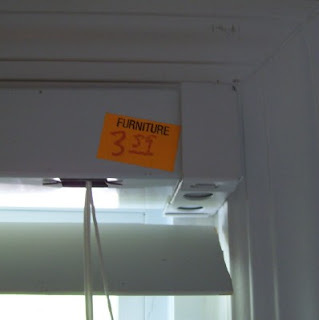 I have passed on several ridiculous priced used blinds (new, these cost about $100 apiece). If we have to do the work of finding brackets and cutting them down, they must be cheap enough to fool with! Wow!!! I'm so happy for your great find!! 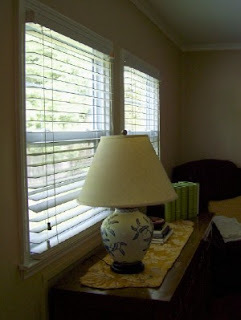 Wow, your windows didn't already have blinds on them from the previous owner? Up here, it is standard for the owner to leave all window dressings/blinds. I had no idea you could trim your own blinds. Good to know! The previous owners did not live in this house. It was his mother's home. After she died they stripped it bare, put in new windows, floors, countertops, etc. So a few of the basics--like blinds--were missing. Though I will say, if you have a house on the market and your blinds or curtains are dirty or outdated, you would do well to "live naked" while the house is on the market. There is nothing like open windows and full sunshine to attract buyers. I love the blinds. We have them too and they make all the difference. You said 'RESALE" in you blog, your not thinking of selling alrady area you?